November 18, 2016 – The brightest area on Ceres stands out amid shadowy, cratered terrain in a dramatic new view from NASA’s Dawn spacecraft, taken as it looked off to the side of the dwarf planet. Dawn snapped this image on October 16, from its fifth science orbit, in which the angle of the sun was different from that in previous orbits. Dawn was about 920 miles (1,480 kilometers) above Ceres when this image was taken — an altitude the spacecraft had reached in early October. Occator Crater, with its central bright region and secondary, less-reflective areas, appears quite prominent near the limb, or edge, of Ceres. At 57 miles (92 kilometers) wide and 2.5 miles (4 kilometers) deep, Occator displays evidence of recent geologic activity. The latest research suggests that the bright material in this crater is comprised of salts left behind after a briny liquid emerged from below, froze and then sublimated, meaning it turned from ice into vapor. Dawn scientists also have released an image of Ceres that approximates how the dwarf planet’s colors would appear to the human eye. This view, produced by the German Aerospace Center in Berlin, combines images taken from Dawn’s first science orbit in 2015, using the framing camera’s red, green and blue filters. 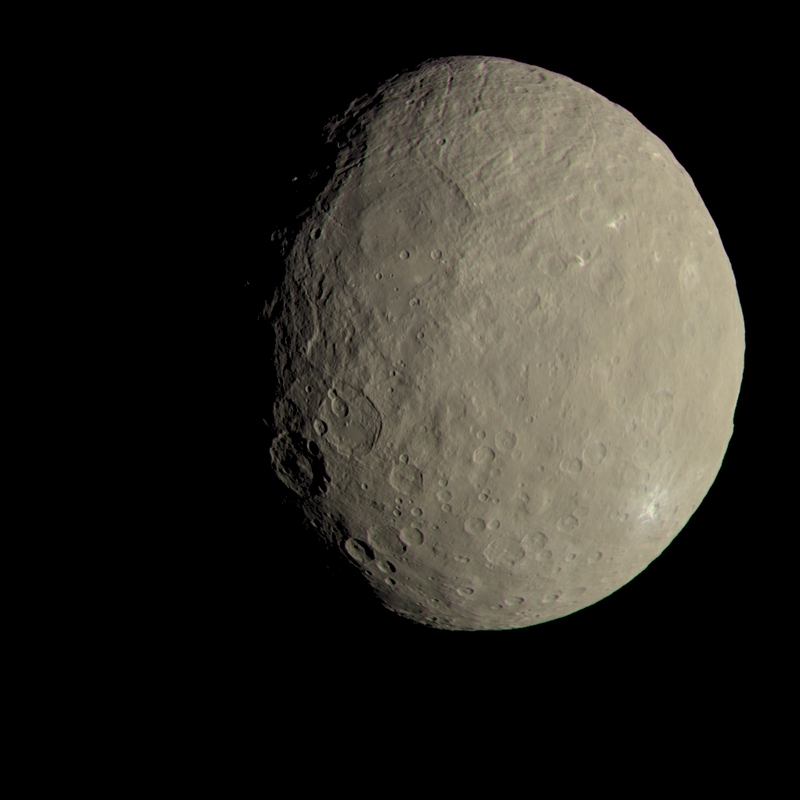 The color was calculated based on the way Ceres reflects different wavelengths of light. The spacecraft has gathered tens of thousands of images and other information from Ceres since arriving in orbit on March 6, 2015. After spending more than eight months studying Ceres at an altitude of about 240 miles (385 kilometers), closer than the International Space Station is to Earth, Dawn headed for a higher vantage point in August. In October, while the spacecraft was at its 920-mile altitude, it returned images and other valuable insights about Ceres. 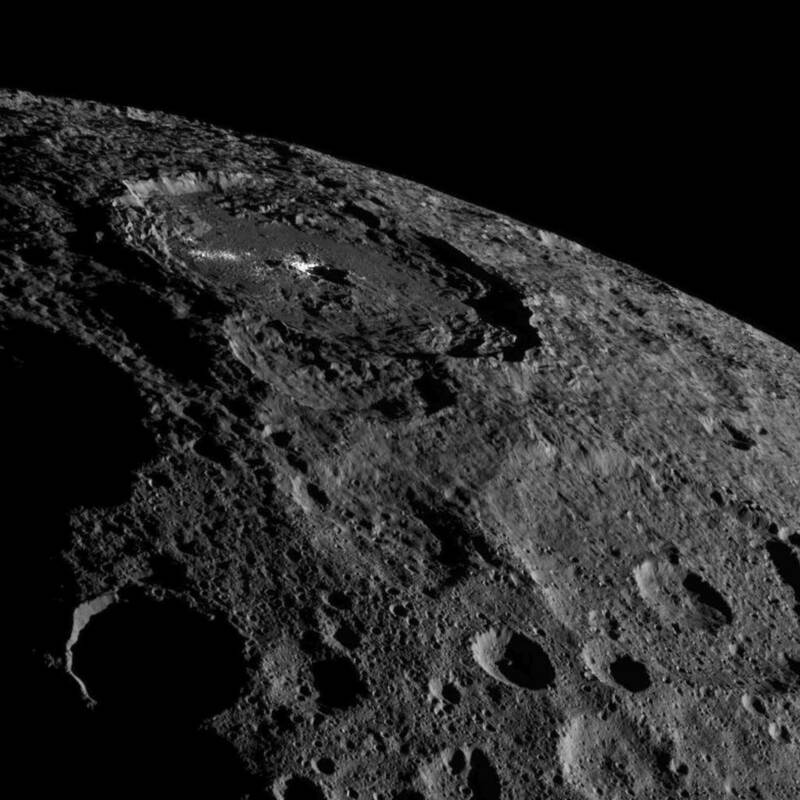 On November 4, Dawn began making its way to a sixth science orbit, which will be over 4,500 miles (7,200 kilometers) from Ceres. While Dawn needed to make several changes in its direction while spiraling between most previous orbits at Ceres, engineers have figured out a way for the spacecraft to arrive at this next orbit while the ion engine thrusts in the same direction that Dawn is already going. This uses less hydrazine and xenon fuel than Dawn’s normal spiral maneuvers. Dawn should reach this next orbit in early December. One goal of Dawn’s sixth science orbit is to refine previously collected measurements. The spacecraft’s gamma ray and neutron spectrometer, which has been investigating the composition of Ceres’ surface, will characterize the radiation from cosmic rays unrelated to Ceres. This will allow scientists to subtract “noise” from measurements of Ceres, making the information more precise. Dawn’s mission is managed by NASA’s Jet Propulsion Laboratory for NASA’s Science Mission Directorate in Washington. Dawn is a project of the directorate’s Discovery Program, managed by NASA’s Marshall Space Flight Center in Huntsville, Alabama. UCLA is responsible for overall Dawn mission science. Orbital ATK Inc., in Dulles, Virginia, designed and built the spacecraft. The German Aerospace Center, Max Planck Institute for Solar System Research, Italian Space Agency and Italian National Astrophysical Institute are international partners on the mission team.